When you study Chinese medicine, you'll discover a life of both passion and purpose. You’ll find a place where professional achievement meets personal fulfillment. Through the art of healing, you'll transform both the lives of your patients and your own. AOMA is a national leader in acupuncture and Chinese medical education. Students at AOMA benefit directly from the school's strong reputation. The institution offers rigorous masters- and doctoral-level curricula taught by internationally-renowned faculty, study abroad opportunities, demonstrated student success, and a supportive community in a dynamic city. The rigorous and comprehensive curriculum and focus on integrative healthcare sets AOMA apart from other schools of Traditional Chinese Medicine (TCM). AOMA was the first stand-alone, single-purpose school of Chinese medicine to achieve regional accreditation. This achievement is a testament to the quality of the school and its programs. At AOMA, the study of integrative medicine draws on the 2,000-year history of Chinese medicine which views the mind, body, and spirit as a single interrelated system. The Master of Acupuncture and Oriental Medicine program provides a foundation for students' development into compassionate, effective practitioners who embody the spirit of this ancient and integrative medical practice. Each of the core components within AOMA's rigorous and comprehensive curriculum promotes mastery of an essential element of Chinese medicine. 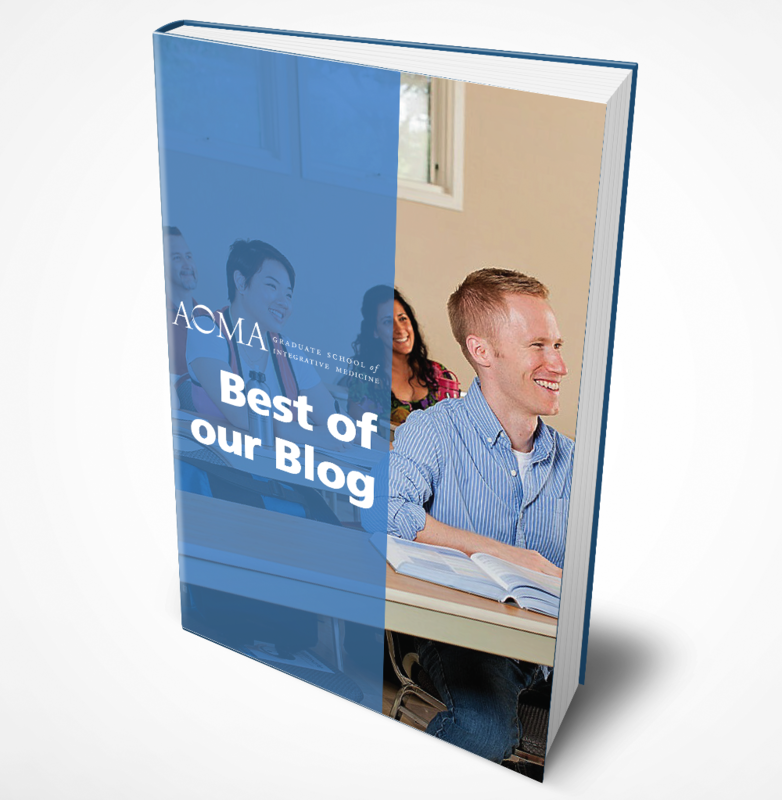 Download the "Best of our Blog" eBook to hear student stories, tips, interviews, and more! The Doctor of Acupuncture and Oriental Medicine (DAcOM) program is a professional doctorate that is believed to become the future entry-level degree required for licensure (pending state-by-state legislation). Currently, the master degree leads to licensure, and the DAcOM contains all of the master competencies with additional doctoral-level work. This program builds on the MAcOM program with advanced skills in assessment and treatment techniques, nutritional knowledge with clinical application, systems-based practice, practice-based learning and improvement, and advanced clinical practice. AOMA has one of the most exciting and flexible DAOM programs in the country. This 74 -credit program is conveniently offered in two modular formats: a 1-year Residency Format; and a 2-year Executive Format. The total length and duration of either program format depends on the learner’s choices regarding the completion of all coursework, clinical training and their research project. The Residency Format is designed as a full-time, on-campus learning immersive experience to students engaged in a year-long, intensive course of study. The majority of the classroom and clinical instruction is delivered on the AOMA campus and affiliated clinical sites, within the 1-year program. However, the research project and externships may extend beyond completion of the 1-year didactic training and be conducted locally or at another site, nationally or internationally. The Executive Format, with a week-long intensive twice per quarter, is designed for you to sustain your success and continue building your practice while developing your research and clinical skills in our program. Week-long intensive, on-campus learning experiences are coupled with extended periods of independent study. While the majority of the classroom and clinical instruction is delivered on the AOMA campus and affiliated clinical sites, the courses are divided between 14 residency weeks to allow working professionals to continue their practice while enrolled. However, the research project and externships may extend beyond the 2 years necessary for completion of the didactic training. At AOMA, you will develop skills in Chinese and integrative medicine. The leadership and critical thinking skills that you will acquire and develop over the course of this program will add depth to your practice, thereby providing a substantive foundation for the improved healthcare and transformative experience you will then be able to offer your patients. There are two non-degree seeking programs at AOMA. Designed to provide an introduction to the fundamentals of Chinese medicine, this series enables students to gain a more in-depth understanding of the basic concepts, theories, and methods that underlie the practices of acupuncture and Chinese herbal medicine while not enrolled in the graduate degree program. The herbal medicine certificate program is for students who have already completed a degree at an ACAOM accredited school of acupuncture and Chinese medicine, but need additional instruction in Chinese herbal medicine to complete requirements for state licensure and the NCCAOM board exam in Chinese herbal medicine. Fill out the form to request admissions information about our various programs.